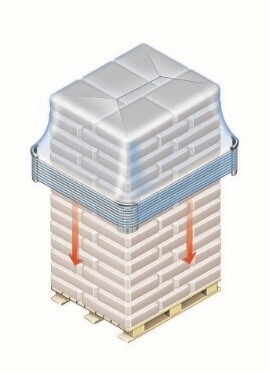 Horizontal Stretch Packaging of Building Materials - Large products! How did the 25 years experienced specialist in stretch films create a game changer with Horizontal Stretch Packaging? An Interview about Horizontal Stretch Packaging with founder of Frank Bruhn ApS in Denmark. As of Sept 1st. the company name is Tentoma ApS (now Tentoma A/S). How did you start with Horizontal Stretch Packaging? Jensen: Hi Mr. Bruhn, let’s jump right into this. Why did some large building material manufacturers contact you? How did the Horizontal Stretch Packaging journey start? Bruhn: I guess they knew me well enough to seek some advice on how to solve some specific problems. You know, I haven’t been doing anything else for more than 2 decades. But you know what, this time I didn’t have any solution to their problem so hang on. You see, existing packaging technologies like stretch hood, heat shrink hood, heat shrink tunnel and pallet shrink wrapping couldn’t solve the problem they challenged me with. Customers wanted to know if it was possible to change existing stretch technology from vertical to horizontal and at the same time solve some of the more critical problems they were experiencing. The initial reason was a fire in a factory packaging line caused by a heat shrink tunnel machine. 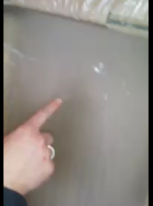 You have a lot of heat exposure in a shrink tunnel and in the worst case it can cause a fire. This constant fire risk explains the higher insurance costs you pay to protect against potential losses. So, the manufacturer wanted me to explore the possibility of making a machine which could package long products and to get well known problems solved. Also he wanted to get rid of the heat tunnel risk. Jensen: Okay, and in, and before this process, I know, that you have collaborated with both manufacturers like Nordfolien (Stretchfolie - Nordfolien in Germany) and also market leader ExxonMobil Chemical (PFFC-online ) in a collaboration between ExxonMobil Chemical and Frank Bruhn ApS. I also understand that you later will explain some challenges in going from vertical to horizontal in stretching of PE-films. But first, please clarify what the difference is between vertical and horizontal stretch packaging equipment. Bruhn: Sure. We can also later talk about why applying stretch film in general can cause challenges when packaging. Okay, let’s start by taking a look on the difference between the vertical and horizontal technologies. These following pictures illustrate it quite well. 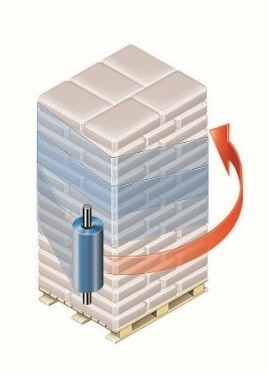 Movie 1: How does the horizontal stretch packaging equipment work? 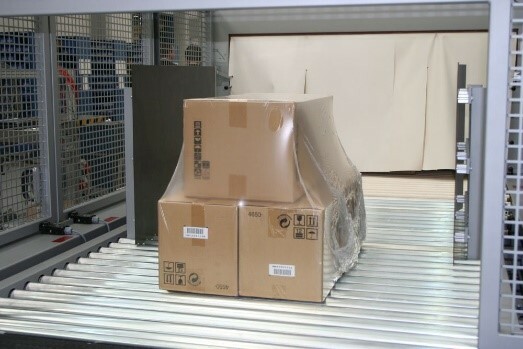 The horizontal stretch technology is one of a kind compared to vertical stretch hood solutions, pallet wrapping (spiral- or ring wrap) and significantly different to the heat shrink process. Once the PE-film has been captured by the grabbing unit, it is led to the product lane where components or products will be stretch packed. When comparing to heat shrink tunnel machines the significant difference is the energy- and film savings that can be achieved. A saving impact can also be seen in the reduced insurance costs to protect against losses in case of a fire due to heat exposure. Bruhn: So, the heat shrink tunnel and our horizontal stretch packaging equipment both operate in a horizontal way. The stretch hood and spiral/ring-wrap technologies internally have their differences which you can read about on-line on Foodprocessing Technology & Manufaturing. The traditional vertical stretch hood technology is an excellent end-of-line packaging solution which our customers typically have. 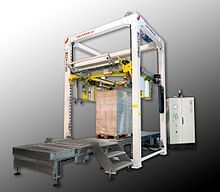 Our Horizontal Stretch Packaging machine will often be located as primary packaging before-end-of-line. You can say, that RoRo StretchPack helps to feed the final packaging station. Some products, e.g. larger building material components and larger insulation material components are today typically running through a manual process or a heat shrink tunnel. Here our customers see the unleashed cost saving potential when replacing these with the RoRo StretchPack. 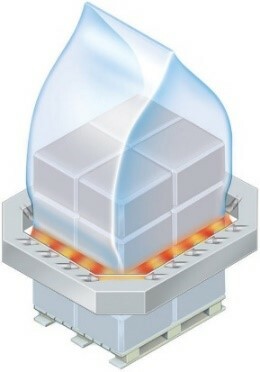 For such larger components or products a traditional vertical stretch hood cannot be applied. 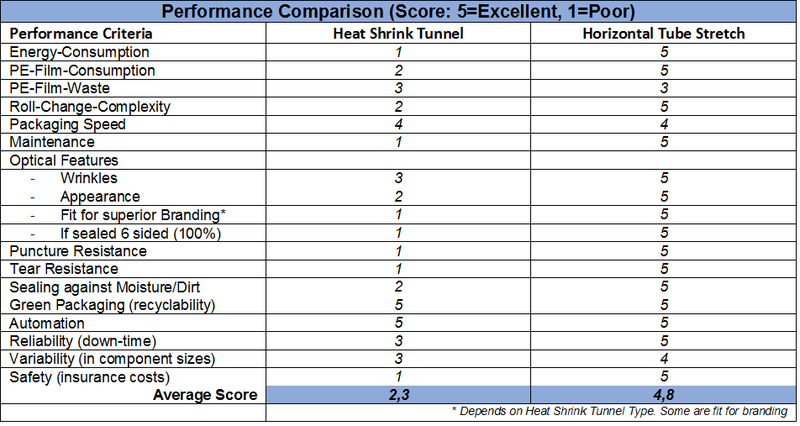 Looking at the performance criteria for horizontal stretch and heat shrink tunnel below, it is obvious that there are some significant differences when comparing for instance operational costs and optical features. Let’s go into this right away. 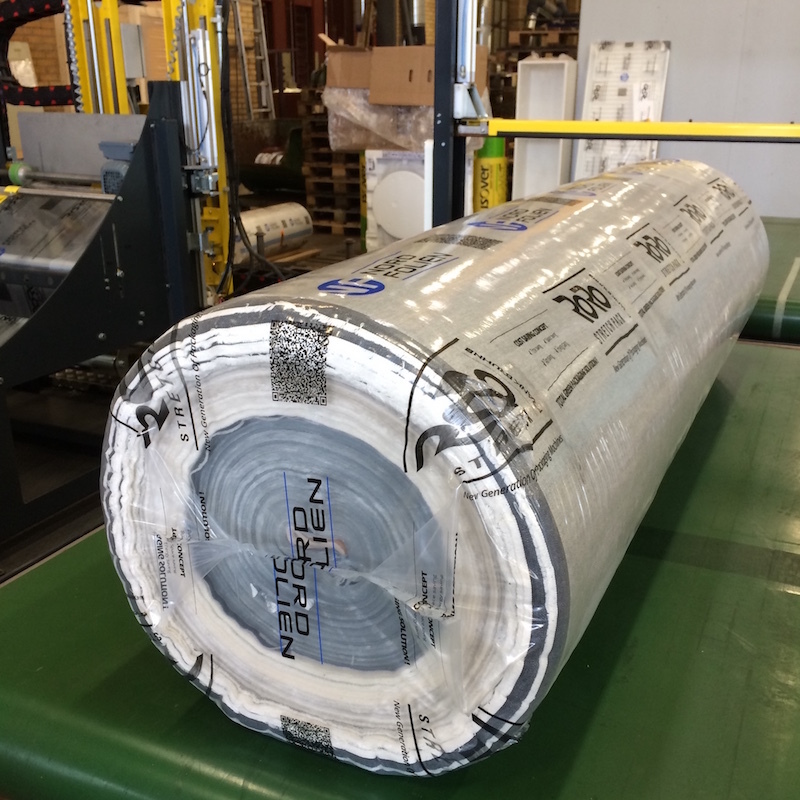 Bruhn: If we talk about comparing performance on horizontal stretch technologies it would make sense to compare the newest technology, our horizontal stretch, with the widely applied heat shrink tunnel technology. We can define various relevant performance criteria that we know are important to our customers including operating costs and savings on energy and film consumption. However, never forget the packaging speed as well as the optical features. Let’s have a look at an extract of a comparison. Bruhn: Obviously, a comparison between different technologies and equipment’s is not always easy and can even vary from customer case to customer case. We did this comparison in the beginning and included, I think more than 80 parameters. We did it in order to verify that we could introduce a solution to the market that would be extremely competitive. And at the same time be disruptive in comparison with at least heat shrink tunnels. Jensen: What were the most critical challenges in going from vertical stretch to horizontal? Bruhn: There were many and once we solved them we also applied for several patents right away to protect these innovations. When thinking back, I would mention three things in particular; firstly, it’s about controlling the winding and un-winding process 100%. My experience from vertical stretch hood technology has taught me that you need to be focused on these two processes if you want a smooth and reliable end result. The second challenge was huge in the industry and about controlling the film opening problematic. How to smartly open or separate the PE-film coming from the film roll? This has for everyone been the big question. Actually we can write a whole book about this issue. 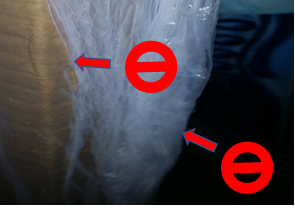 The problem is that 2 PE-film sides stick together and must be turned into a PE-stretchfilm-tube in order to be stretched. As the film roll gets rolled off you will find that the it gets harder and harder to open or separate. We have now found a way to solve this by introducing a more stationary tool which enables us to operate with a more static film. Now you know what the problem was and I think it would be an idea to take up this topic separately later on in a separate post. The third critical challenge was to adapt our technology into a horizontal mode. Let’s talk about the winding process first. Bruhn: The winding and un-winding process we can also call film roll-on and film roll-off. This, by the way, led to the name of our final packaging equipment solution; RoRo StretchPack. It is critical to master this film-winding and film-unwinding process in order to tackle the well-known challenges from all technologies, such as film-wrinkles, holes in the PE-film, precise film positioning and finally the important optical features. The principle in doing it horizontally is to create a horizontal tube and pull it tightly over the component which is fed-in on a conveyor belt. Well, it is principally a kind of stretch hood in horizontal mode. The components, and not the people, are moving which frees up resources that can be dedicated to other value-added activities. 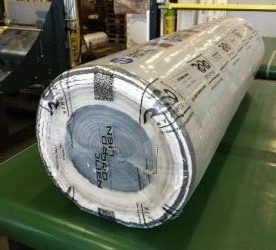 Jensen: Maybe it is a good time now to watch the video showing the actual roll-on and roll-off process in the RoRo StretchPack solution (Horizontal Stretch Packaging). Let’s see it now. Bruhn: As you could see in the video our patented roll-on and roll-off process enables us to 100% control the winding and un-winding of the film-material. So we can deliver a 100% sealing proof packaging if this should be required. If not, you still get all the other benefits mentioned during our talk. Now, the principle in a heat shrink tunnel concept is that an excessive amount of film is being shrinked. We instead offer an optimized, and much smaller film that is being stretched. Do you see the saving potential here? We achieve a much lower film consumption and most importantly we can reduce the energy consumption bill and improve the CO2 foot-print of our customers. Most customers care a lot about green packaging and have fixed KPI’s on improving this. In fact, just the energy savings and the film consumption savings, compared to heat shrink tunnel packaging, can give you a very, very interesting ROI besides reducing the CO2 emission. Jensen: And the challenge in creating a solution that made it possible to operate horizontally? Bruhn: We needed to focus on as few machine part movements as possible between the actual PE-film-roll, film-feed-in point and the component to be packaged. The thing to know was; where does the product come from and where must it depart after the packaging. We decided to position the PE-film-roll unit right next to the horizontal stretch packaging operation point in order to increase the feed-in-efficiency and packaging speed. In this way we can achieve as a minimum, the same speed, compared to heat shrinking machines. Today we also offer several options, like a duplex PE-film-feed-in or semi-flow packaging. It all depends on what our customers need and want. Today it is no problem to reach an even higher speed. Jensen: I understand that you have had to study intensely whether it makes sense for a customer to change from heat-shrink-tunnel into horizontal stretching. What 1 or 2 things would you recommend to look at here? Bruhn: Hmm, well, I did mention the energy savings, green packaging and improved CO2 foot print. What many customers also look at is their own value proposition. See, if your products can live up to the value proposition when considering for instance logistics and do a simple 3-step-test yourself. Bruhn: When deciding on your packaging solution you should consider the whole outbound logistic journey. Think about it; you often will have several intermediate loading and unloading points within your own manufacturing facilities, at the logistic forwarder, 1 or 2 logistic international transportation hubs with loading and unloading, unloading at customer, storage, new shipment and then unloading at the final end customer. All these loading and unloading points calls for well-considered package solutions to sustain them. And, don’t forget the always changing weather elements during the whole journey. What we see is also that customer geographies and destinations are not static. The packaging should be adopted to always more and more global supply chain developments. Your film-supplier can surely advise you based on their vast experience. has made clear to me that the choice of PE-film, is not where you want to compromise on quality. But be aware. You may need to drive down costs continuously and at the same time ensure excellent quality. Certainly. But what I have seen again and again is that lack of know-how in choosing the appropriate PE-film for the packaging process leads to unnecessary high costs. 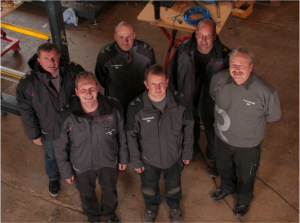 Start by making sure, that your machinery is adjusted precisely. Whatever machine we are talking about. Whatever logistic challenges you have. This can lead to significant savings on consumption. As to the quality improvements, there are certainly a lot of parameters to be aware about and we cannot cover them all here so let me show you just one 3-step-test that you can do yourself without being an expert. 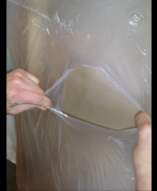 Video 3: How to check your packaging quality fast and easy. 1. Check the optical features! Does it live up to your value proposition and your customers’ expectations? Will your brand be represented the way you want it to at the final destination? 2. Make a punctual resistance test! Is hardly no pressure needed to break the film material? If easy punctured; is it realistic that it will sustain all customer destinations with all loading and unloading points? 3. Test the tearing resistance! Does the PE-film-material easily tear down/up/sidewards when tearing in the point where you made a hole in step 2? How will it affect the load resistance of multiple packaged products after several unloading and loading points? Does it imply risks to be aware about for your valued customer? Bruhn: So, this easy do-it-yourself-test will often give you a good indication whether you should improve something or not. Taking it to the next level will of course mean to carry out the same test at maybe 3 or 4 different customer destinations in different geographic locations. Jensen: I’m sure there are many other quality check points we can address like the above. However, here at the end, maybe it’s time for you to tell a little bit about the company today. Bruhn: For me, and my brother who is the co-founder, it is important that the original company values are the same today as when we started years ago. Also after we have grown together with our international oriented customers. To see, that everyone in the company lives up to these same values when performing their jobs, whether in our supply chain, service, sales or management, really makes us proud. And what really makes me excited is that our RoRo StretchPack solution opens up the minds of our customers. Again and again I hear that they, much better than us, can see the vast opportunities in our solution and the packaging contexts it can be used in. It’s very simple. At the end of the day they know their supply chain better than any outsiders. Jensen: Thanks for taking the time for this internal company interview. I also look forward to working together on our upcomming webinars where we will go into detail with the RoRo StretchPack technology and adress savings on film and energy and much more. PS: If you are interested in learning more about Horizontal Stretch Packaging for e.g. building materials (wood/timber, insulation products in roll/batch, gipsonite etc,) or, you want to participate in a Webinar to get deeper insight, then please send an e-mail to bbj@tentoma.com.